In the very near future, hams, turkeys and roasts across the land will be broiled, braised and baked to perfection. From oven to table, the wafting scent of dinner will cause family and friends to gather ‘round in eager excitement. And then you cut into it, ravaging the poor beast into disrespectful clumps. Enthusiastic smiles become replaced by disappointed grimaces. Don’t let your stunning table presentation fall into a meaty pile of disarray: the Victorinox Precise Slice Knife will help you clean up your slicing act. 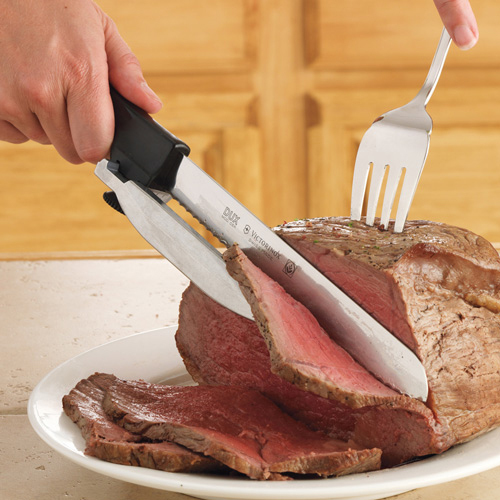 The serrated knife features an adjustable guide to help you create perfect slices from 1-mm to 15-mm thick. Operating similar to a mechanical slicer, the offset guide directs the cutting edge all the way through the meat during the slicing action. Serve thick slices for the entrée and then just as easily cut some thinly sliced for sandwiches the next day. With neat and clean dinner presentation along with perfect leftovers, your guests may just never leave. I hate messing up multiple utensils in the kitchen, especially when it comes to making something simple like a sandwich or a bagel. 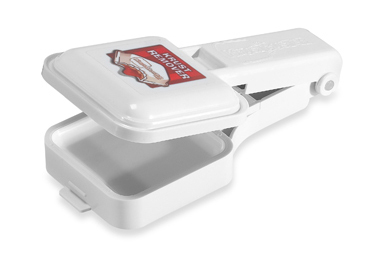 It is just too tempting to use a serrated knife to spread mayo, peanut butter or cream cheese. I have torn many a package of cream cheese into shreds trying to use a sharp knife to dig out the spread for my bagel. It’s a lesson I seem to refuse to learn. 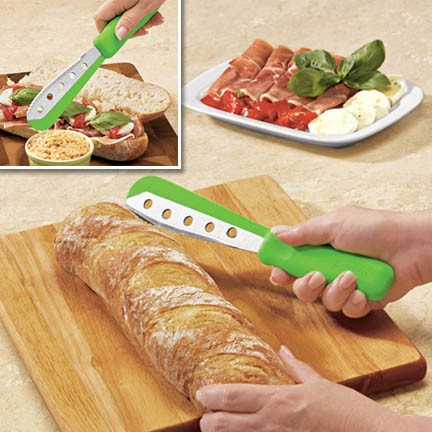 Now, I don’t have to; the Spachello Slice & Spread combines a cutting and spreading knife into one. Perfect for people like me who go out of their way to minimize utensil use, the Spachello is the best thing for sandwiches (and tear-prone packaging) since sliced bread. If you’ve got little ones running about, chances are when it comes to sandwiches, they prefer them with the crusts cut off. It also is highly probable that at times you wish they would make them on their own. However, a simple peanut butter and jelly sandwich can turn into a messy fiasco as kids try to master the art of sandwich construction. At least when it comes to the crust-removal department, there is a solution. Sometimes smaller is better. If you have a size-challenged kitchen and a penchant for hot grilled sandwiches (or items of similar size), lugging out the big old fry pan can be a chore. 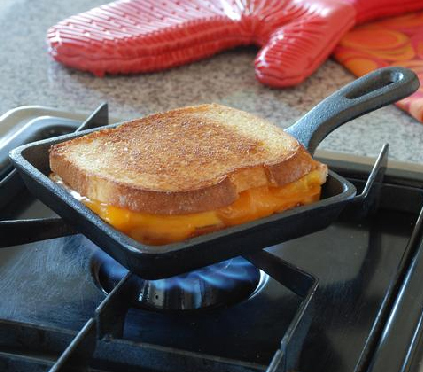 The Cast Iron Sandwich Pan is ideal for cooking up single serve meals and doesn’t take up a lot of room. Having a small pan on the side can certainly be convenient. For a single egg or perhaps sautéing some veggies, the small size makes it easy to work with and best of all, there’s less to clean up. Even as a kid I never quite got the whole sandwich “with the crusts cut off” thing. Crusts are delicious too and deserve such recognition. 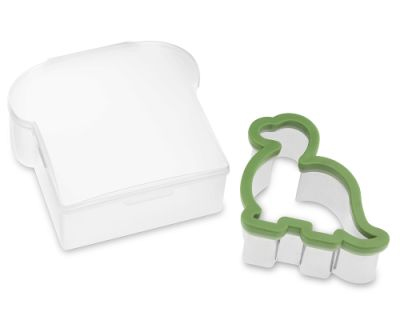 However if your young’uns need a little encouragement to bite into their PB&J, check out this Dino Sandwich Cutter from Williams-Sonoma. 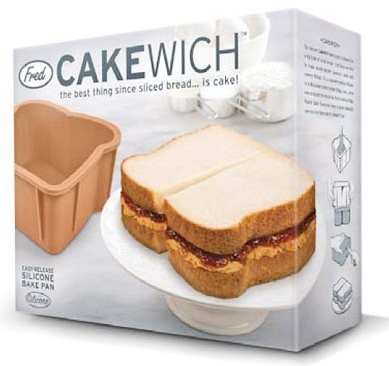 Not only does the sandwich cutter trim off offensive crusts, but it also makes mealtime fun. What little kid (well, the boys at least) wouldn’t enjoy pretending to be some great beast tearing into a dinosaur?